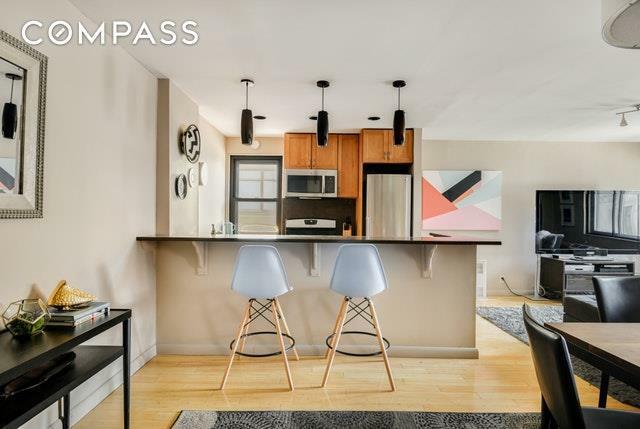 Oversized corner one-bedroom with balcony at the Thomas Eddy, a full-service pet-friendly elevator co-op at the crossroads of Chelsea, the West Village, and the Meatpacking District. 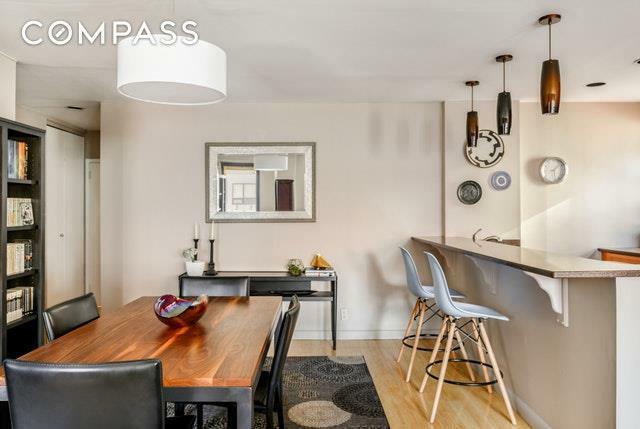 This lovely home offers a renovated kitchen and bath, spacious open plan living, a large master bedroom, and two exposures (North and East) with lovely city views -- all in an truly unbeatable downtown location. 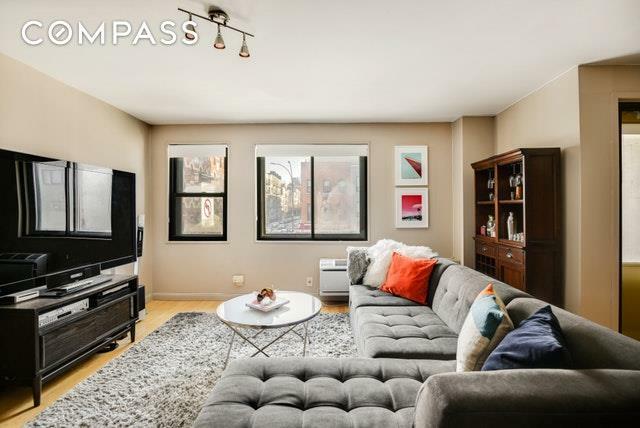 This glamorous Chelsea junior-4 apartment features an expansive floorplan, including a windowed dining area the opens to a large corner living room beyond. The open windowed kitchen boasts dark granite counters, custom wood cabinetry, a large breakfast bar, gas stove and oven, and a stainless steel GE appliance suite including dishwasher and built-in microwave. The bathroom is newly renovated, complete with contemporary light tile, a new marble-topped sink, custom glass sliding shower door, and a large soaking tub. There is ample storage throughout, and in addition to a large coat closet and utility closet, the king-sized master bedroom features an ~8' long custom-fitted sliding door closet. The apartment also offers custom-fitted soundproof windows and recessed lighting throughout, thru-wall AC units, beautiful bamboo floors, and a small private balcony overlooking 8th Avenue.The Thomas Eddy is a 6-story 24-hour doorman co-op with a live-in super, full time porter, planted common courtyard, and laundry on every floor. 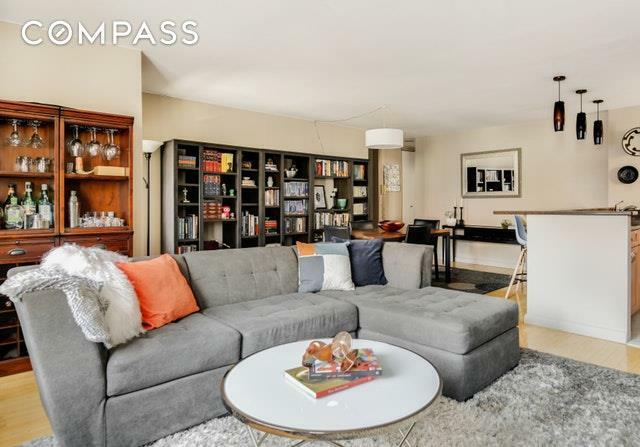 Located on Eighth Avenue between West 14th and 15th Streets, the building is at the crossroads of three of Manhattans most beloved neighborhoods Chelsea, the West Village, and the Meatpacking district. Public transportation is a breeze, with the A/C/E and L lines right outside your front door, and the 1/2/3 Line only one block away. Pied-a-terres and Pets are welcome!